Popularizing the term "black hole"
Coining the term "neutron moderator"
John Archibald Wheeler (July 9, 1911 – April 13, 2008) was an American theoretical physicist. He was largely responsible for reviving interest in general relativity in the United States after World War II. Wheeler also worked with Niels Bohr in explaining the basic principles behind nuclear fission. Together with Gregory Breit, Wheeler developed the concept of the Breit–Wheeler process. He is best known for linking the term "black hole" to objects with gravitational collapse already predicted early in the 20th century, for coining the terms "quantum foam", "neutron moderator", "wormhole" and "it from bit", and for hypothesizing the "one-electron universe". Wheeler earned his doctorate at Johns Hopkins University under the supervision of Karl Herzfeld, and studied under Breit and Bohr on a National Research Council fellowship. In 1939 he teamed up with Bohr to write a series of papers using the liquid drop model to explain the mechanism of fission. During World War II, he worked with the Manhattan Project's Metallurgical Laboratory in Chicago, where he helped design nuclear reactors, and then at the Hanford Site in Richland, Washington, where he helped DuPont build them. He returned to Princeton after the war ended, but returned to government service to help design and build the hydrogen bomb in the early 1950s. For most of his career, Wheeler was a professor at Princeton University, which he joined in 1938, remaining until his retirement in 1976. At Princeton he supervised 46 PhDs, more than any other professor in the Princeton physics department. Wheeler was born in Jacksonville, Florida on July 9, 1911 to librarians Joseph Lewis Wheeler and Mabel Archibald (Archie) Wheeler. He was the oldest of four children, having two younger brothers, Joseph and Robert, and a younger sister, Mary. Joseph earned a Ph.D. from Brown University and a Master of Library Science from Columbia University. Robert earned a Ph.D. in geology from Harvard University and worked as a geologist for oil companies and at colleges. Mary studied library science at the University of Denver and became a librarian. They grew up in Youngstown, Ohio, but spent a year in 1921 to 1922 on a farm in Benson, Vermont, where Wheeler attended a one-room school. After they returned to Youngstown he attended Rayen High School. After graduating from the Baltimore City College high school in 1926, Wheeler entered Johns Hopkins University with a scholarship from the state of Maryland. He published his first scientific paper in 1930, as part of a summer job at the National Bureau of Standards. He earned his doctorate in 1933. His dissertation research work, carried out under the supervision of Karl Herzfeld, was on the "Theory of the Dispersion and Absorption of Helium". He received a National Research Council fellowship, which he used to study under Gregory Breit at New York University in 1933 and 1934, and then in Copenhagen under Niels Bohr in 1934 and 1935. In a 1934 paper, Breit and Wheeler introduced the Breit–Wheeler process, a mechanism by which photons can be potentially transformed into matter in the form of electron-positron pairs. The University of North Carolina at Chapel Hill made Wheeler an associate professor in 1937, but he wanted to be able work more closely with the experts in particle physics. He turned down an offer in 1938 of an associate professorship at Johns Hopkins University in favor of an assistant professorship at Princeton University. Although it was a lesser position, he felt that Princeton, which was building up its physics department, was a better career choice. He remained a member of the faculty there until 1976. In a 1937 paper "On the Mathematical Description of Light Nuclei by the Method of Resonating Group Structure", Wheeler introduced the S-matrix – short for scattering matrix – "a unitary matrix of coefficients connecting the asymptotic behavior of an arbitrary particular solution [of the integral equations] with that of solutions of a standard form." Werner Heisenberg subsequently developed the idea of the S-matrix in the 1940s. Due to the problematic divergences present in quantum field theory at that time, Heisenberg was motivated to isolate the essential features of the theory that would not be affected by future changes as the theory developed. In doing so he was led to introduce a unitary "characteristic" S-matrix, which became an important tool in particle physics. Wheeler did not develop the S-matrix, but joined Edward Teller in examining Bohr's liquid drop model of the atomic nucleus. They presented their results at a meeting of the American Physical Society in New York in 1938. Wheeler's Chapel Hill graduate student Katharine Way also presented a paper, which she followed up in a subsequent article, detailing how the liquid drop model was unstable under certain conditions. Due to a limitation of the liquid drop model, they all missed the opportunity to predict nuclear fission. The news of Lise Meitner and Otto Frisch's discovery of fission was brought to America by Bohr in 1939. Bohr told Leon Rosenfeld, who informed Wheeler. Bohr and Wheeler set to work applying the liquid drop model to explain the mechanism of nuclear fission. As the experimental physicists studied fission, they uncovered puzzling results. George Placzek asked Bohr why uranium seemed to fission with both very fast and very slow neutrons. Walking to a meeting with Wheeler, Bohr had an insight that the fission at low energies was due to the uranium-235 isotope, while at high energies it was mainly due to the far more abundant uranium-238 isotope. They co-wrote two more papers on fission. Their first paper appeared in Physical Review on September 1, 1939, the day Germany invaded Poland, starting World War II in Europe. Considering the notion that positrons were electrons that were traveling backwards in time, he came up in 1940 with his one-electron universe postulate: that there was in fact only one electron, bouncing back and forth in time. His graduate student, Richard Feynman, found this hard to believe, but the idea that positrons were electrons traveling backwards in time intrigued him and Feynman incorporated the notion of the reversibility of time into his Feynman diagrams. Soon after the Japanese bombing of Pearl Harbor brought the United States into World War II, Wheeler accepted a request from Arthur Compton to join the Manhattan Project's Metallurgical Laboratory at the University of Chicago. He moved there in January 1942, joining Eugene Wigner's group, which was studying nuclear reactor design. He co-wrote a paper with Robert F. Christy on "Chain Reaction of Pure Fissionable Materials in Solution", which was important in the plutonium purification process. It would not be declassified until December 1955. He gave the neutron moderator its name, replacing the term "slower downer" used by Enrico Fermi. After the United States Army Corps of Engineers took over the Manhattan Project, it gave responsibility for the detailed design and construction of the reactors to DuPont. Wheeler became part of the DuPont design staff. He worked closely with its engineers, commuting between Chicago and Wilmington, Delaware, where DuPont had its headquarters. He moved his family to Wilmington in March 1943. DuPont's task was not just to build nuclear reactors, but an entire plutonium production complex at the Hanford Site in Washington. As work progressed, Wheeler relocated his family again in July 1944, this time to Richland, Washington, where he worked in the scientific buildings known as the 300 area. Even before the Hanford Site started up the B Reactor, the first of its three reactors, on September 15, 1944, Wheeler had been concerned that some nuclear fission products might turn out to be nuclear poisons, the accumulation of which would impede the ongoing nuclear chain reaction by absorbing many of the thermal neutrons that were needed to continue a chain reaction. In an April 1942 report, he predicted that this would reduce the reactivity by less than one percent so long as no fission product had a neutron capture cross section of more than 100,000 barns. After the reactor unexpectedly shut down, and then just as unexpectedly restarted about fifteen hours later, he suspected iodine-135, with a half life of 6.6 hours, and its daughter product, xenon-135, which has a half life of 9.2 hours. Xenon-135 turned out to have a neutron capture cross-section of well over 2 million barns. The problem was corrected by adding additional fuel rods to burn out the poison. Wheeler had a personal reason for working on the Manhattan Project. His brother Joe, fighting in Italy, sent him a postcard with a simple message: "Hurry up". It was already too late: Joe was killed in October 1944. "Here we were," Wheeler later wrote, "so close to creating a nuclear weapon to end the war. I couldn't stop thinking then, and haven't stopped thinking since, that the war could have been over in October 1944." Joe left a widow and baby daughter, Mary Jo, who later married physicist James Hartle. In August 1945 Wheeler and his family returned to Princeton, where he resumed his academic career. Working with Feynman, he explored the possibility of physics with particles, but not fields, and carried out theoretical studies of the muon with Jayme Tiomno, resulting in a series of papers on the topic, including a 1949 paper in which Tiomno and Wheeler introduced the "Tiomno Triangle", which related different forms of radioactive decay. He also suggested the use of muons as a nuclear probe. This paper, written and privately circulated in 1949 but not published until 1953, resulted in a series of measurements of the Chang radiation emitted by muons. Muons are a component of cosmic rays, and Wheeler became the founder and first director of Princeton's Cosmic Rays Laboratory, which received a substantial grant of $375,000 from the Office of Naval Research in 1948. He received a Guggenheim Fellowship in 1946, which allowed him to spend the 1949–50 academic year in Paris. The "Sausage" device of Ivy Mike nuclear test on Enewetak Atoll. The Sausage was the first true hydrogen bomb ever tested. The 1949 detonation of Joe-1 by the Soviet Union prompted an all-out effort by the United States, led by Teller, to develop the more powerful hydrogen bomb in response. Henry D. Smyth, Wheeler's department head at Princeton, asked him to join the effort. Most physicists were, like Wheeler, trying to re-establish careers interrupted by the war and were reluctant to face more disruption. Others had moral objections. Those who agreed to participate included Emil Konopinski, Marshall Rosenbluth, Lothar Nordheim and Charles Critchfield, but there was also now a body of experienced weapons physicists at the Los Alamos Laboratory, led by Norris Bradbury. Wheeler agreed to go to Los Alamos after a conversation with Bohr. Two of his graduate students from Princeton, Ken Ford and John Toll, joined him there. At Los Alamos, Wheeler and his family moved into the house on "Bathtub Row" that had been occupied by Robert Oppenheimer and his family during the war. In 1950 there was no practical design for a hydrogen bomb. Calculations by Stan Ulam and others showed that Teller's "Classical Super" would not work. Teller and Wheeler created a new design known as "Alarm Clock", but it was not a true thermonuclear weapon. Not until January 1951 did Ulam come up with a workable design. In 1951 Wheeler obtained permission from Bradbury to set up a branch office of the Los Alamos laboratory at Princeton, known as Project Matterhorn, which had two parts. Matterhorn S (for stellarator, another name coined by Wheeler), under Lyman Spitzer, investigated nuclear fusion as a power source. Matterhorn B (for bomb), under Wheeler, engaged in nuclear weapons research. Senior scientists remained uninterested and aloof from the project, so he staffed it with young graduate and post-doctoral students. In January 1953 he was involved in a security breach when he lost a highly classified paper on lithium-6 and the hydrogen bomb design during an overnight train trip. This resulted in Wheeler being given an official reprimand. Matterhorn B's efforts were crowned by the success of the Ivy Mike nuclear test at Enewetak Atoll in the Pacific, on November 1, 1953, which Wheeler witnessed. The yield of the Ivy Mike "Sausage" device was reckoned at 10.4 megatons of TNT (44 PJ), about 30 percent higher than Matterhorn B had estimated. Matterhorn B was discontinued, but Matterhorn S endures as the Princeton Plasma Physics Laboratory. After concluding his Matterhorn Project work, Wheeler resumed his academic career. In a 1955 paper, he theoretically investigated the geon, an electromagnetic or gravitational wave that is held together in a confined region by the attraction of its own field. He coined the name as a contraction of "gravitational electromagnetic entity." He found that the smallest geon was a toroid the size of the Sun, but millions of times heavier. During the 1950s Wheeler formulated geometrodynamics, a program of physical and ontological reduction of every physical phenomenon, such as gravitation and electromagnetism, to the geometrical properties of a curved space-time. His research on the subject was published in 1957 and 1961. Wheeler envisaged the fabric of the universe as a chaotic sub-atomic realm of quantum fluctuations, which he called "quantum foam". General relativity had been considered a less respectable field of physics, being detached from experiment. Wheeler was a key figure in the revival of the subject, leading the school at Princeton University, while Dennis William Sciama and Yakov Borisovich Zel'dovich developed the subject at Cambridge University and the University of Moscow, respectively. Wheeler and his students made substantial contributions to the field during the Golden Age of General Relativity. While working on mathematical extensions to Einstein's general relativity in 1957, Wheeler introduced the concept and word wormhole to describe hypothetical "tunnels" in space-time. Bohr asked if they were stable and further research by Wheeler determined that they are not. His work in general relativity included the theory of gravitational collapse. He used the term black hole in 1967 during a talk he gave at the NASA Goddard Institute of Space Studies (GISS). Wheeler was also a pioneer in the field of quantum gravity due to his development, with Bryce DeWitt, of the Wheeler–DeWitt equation in 1967. Stephen Hawking later described Wheeler and DeWitt's work as the equation governing the "wave function of the Universe". Looking back on Wheeler's 10 years at Texas, many quantum information scientists now regard him, along with IBM's Rolf Landauer, as a grandfather of their field. That, however, was not because Wheeler produced seminal research papers on quantum information. He did not—with one major exception, his delayed-choice experiment. Rather, his role was to inspire by asking deep questions from a radical conservative viewpoint and, through his questions, to stimulate others' research and discovery. Wheeler's delayed choice experiment is actually several thought experiments in quantum physics that he proposed, with the most prominent among them appearing in 1978 and 1984. These experiments are attempts to decide whether light somehow "senses" the experimental apparatus in the double-slit experiment it will travel through and adjusts its behavior to fit by assuming the appropriate determinate state for it, or whether light remains in an indeterminate state, neither wave nor particle, and responds to the "questions" asked of it by responding in either a wave-consistent manner or a particle-consistent manner depending on the experimental arrangements that ask these "questions". Wheeler's graduate students included Katharine Way, Richard Feynman, David Hill, Bei-Lok Hu, Kip Thorne, Jacob Bekenstein, John R. Klauder, William Unruh, Robert M. Wald, Arthur Wightman, Charles Misner, Max Tegmark and Hugh Everett. Wheeler gave a high priority to teaching, and continued to teach freshman and sophomore physics, saying that the young minds were the most important. With Kent Harrison, Kip Thorne and Masami Wakano, Wheeler wrote Gravitation Theory and Gravitational Collapse (1965). This led to the voluminous general relativity textbook Gravitation (1973), co-written with Misner and Thorne. Its timely appearance during the golden age of general relativity and its comprehensiveness made it an influential relativity textbook for a generation. Wheeler teamed up with Edwin F. Taylor to write Spacetime Physics (1966) and Scouting Black Holes (1996). At Princeton he supervised 46 PhDs, more than any other professor in the Princeton physics department. Alluding to Wheeler's "mass without mass", the festschrift honoring his 60th birthday was titled Magic Without Magic: John Archibald Wheeler: A Collection of Essays in Honor of his Sixtieth Birthday (1972). His writing style could also attract parodies, including one by "John Archibald Wyler" that was affectionately published by a relativity journal. Wheeler speculated that reality is created by observers in the universe. "How does something arise from nothing? ", he asked about the existence of space and time. He also coined the term "Participatory Anthropic Principle" (PAP), a version of a Strong Anthropic Principle. In 1990, Wheeler suggested that information is fundamental to the physics of the universe. According to this "it from bit" doctrine, all things physical are information-theoretic in origin. In fact, according to Eine Entgegnung auf den Artikel "Am Anfang war das Bit", he plagiarized this idea from the german quantum physicist and Nobel nominee C.F. von Weizsäcker without citing him. 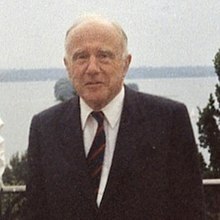 Von Weizsäcker invited Wheeler in 1980 to his conference about his Ur-theory claiming that all scientific statements could be reduced to a sequence of binary alternatives. Hence the entire physical nature can be described by Ur-alternatives i.e. quantum-bits in today's language. Wheeler: It from bit. Otherwise put, every it — every particle, every field of force, even the space-time continuum itself — derives its function, its meaning, its very existence entirely — even if in some contexts indirectly — from the apparatus-elicited answers to yes-or-no questions, binary choices, bits. It from bit symbolizes the idea that every item of the physical world has at bottom — a very deep bottom, in most instances — an immaterial source and explanation; that which we call reality arises in the last analysis from the posing of yes-no questions and the registering of equipment-evoked responses; in short, that all things physical are information-theoretic in origin and that this is a participatory universe. In developing the Participatory Anthropic Principle (PAP), an interpretation of quantum mechanics, Wheeler used a variant on Twenty Questions, called Negative Twenty Questions, to show how the questions we choose to ask about the universe may dictate the answers we get. In this variant, the respondent does not choose or decide upon any particular or definite object beforehand, but only on a pattern of "Yes" or "No" answers. This variant requires the respondent to provide a consistent set of answers to successive questions, so that each answer can be viewed as logically compatible with all the previous answers. In this way, successive questions narrow the options until the questioner settles upon a definite object. Wheeler's theory was that, in an analogous manner, consciousness may play some role in bringing the universe into existence. Wheeler: We are participators in bringing into being not only the near and here but the far away and long ago. We are in this sense, participators in bringing about something of the universe in the distant past and if we have one explanation for what's happening in the distant past why should we need more? Martin Redfern: Many don't agree with John Wheeler, but if he's right then we and presumably other conscious observers throughout the universe, are the creators — or at least the minds that make the universe manifest. In 1979, Wheeler spoke to the American Association for the Advancement of Science (AAAS), asking it to expel parapsychology, which had been admitted ten years earlier at the request of Margaret Mead. He called it a pseudoscience, saying he did not oppose earnest research into the questions, but he thought the "air of legitimacy" of being an AAAS-Affiliate should be reserved until convincing tests of at least a few so-called psi effects could be demonstrated. In the question and answer period following his presentation "Not consciousness, but the distinction between the probe and the probed, as central to the elemental quantum act of observation", Wheeler incorrectly stated that J. B. Rhine had committed fraud as a student, for which he apologized in a subsequent letter to the journal Science. His request was turned down and the Parapsychological Association remained a member of the AAAS. For 72 years, Wheeler was married to Janette Hegner, a teacher and social worker. They became engaged on their third date, but agreed to defer marriage until after he returned from Europe. They were married on June 10, 1935, five days after his return. Jobs were hard to come by during the Great Depression, but Arthur Ruark offered Wheeler a position as an assistant professor at the University of North Carolina at Chapel Hill, at an annual salary of $2,300, which was less than the $2,400 Janette was offered to teach at the Rye Country Day School. They had three children: Letitia, James English and Alison Wheeler. Wheeler and Hegner were founding members of the Unitarian Church of Princeton, and she initiated the Friends of the Princeton Public Library. In their later years, Hegner accompanied him on sabbaticals in France, Los Alamos, New Mexico, the Netherlands, and Japan. Hegner died in October 2007 at the age of 99. Wheeler was influential in mentoring a generation of physicists of the Golden Age of General Relativity, who made notable contributions to quantum mechanics and gravitation. Wheeler won numerous prizes and awards, including the Enrico Fermi Award in 1968, the Franklin Medal in 1969, the Einstein Prize in 1969, the National Medal of Science in 1971, the Niels Bohr International Gold Medal in 1982, the Oersted Medal in 1983, the J. Robert Oppenheimer Memorial Prize in 1984 and the Wolf Foundation Prize in 1997. He was a member of the American Philosophical Society, the Royal Academy, the Accademia Nazionale dei Lincei, and the Century Association. He received honorary degrees from 18 different institutions. In 2001, Princeton used a $3 million gift to establish the John Archibald Wheeler/Battelle Professorship in Physics. After his death, the University of Texas named the John A. Wheeler Lecture Hall in his honor. On April 13, 2008, Wheeler died of pneumonia at the age of 96 in Hightstown, New Jersey. Wheeler, John Archibald (1962). Geometrodynamics. New York: Academic Press. OCLC 1317194. Harrison, B. Kent; Kip S. Thorne; Masami Wakano; John Archibald Wheeler (1965). Gravitation Theory and Gravitational Collapse. Chicago: The University of Chicago Press. LCCN 65017293. Misner, Charles W.; Kip S. Thorne; John Archibald Wheeler (September 1973). Gravitation. San Francisco: W. H. Freeman. ISBN 0-7167-0344-0. Wheeler, John Archibald (1979). Some Men and Moments in the History of Nuclear Physics: The Interplay of Colleagues and Motivations. Minneapolis: University of Minnesota Press. OCLC 6025422. Wheeler, John Archibald (1990). A Journey Into Gravity and Spacetime. -Scientific American Library. New York: W.H. Freeman. ISBN 0-7167-6034-7. Taylor, Edwin F.; Wheeler, John Archibald (1992). Spacetime Physics: Introduction to Special Relativity'. New York: W. H. Freeman. ISBN 0-7167-2327-1. Wheeler, John Archibald (1994). At Home in the Universe. New York: American Institute of Physics. ISBN 1-56396-500-3. Ciufolini, Ignazio; Wheeler, John Archibald (1995). Gravitation and Inertia. Princeton, New Jersey: Princeton University Press. ISBN 0-691-03323-4. Wheeler, John Archibald (1998). Geons, Black Holes, and Quantum Foam: A Life in Physics. New York: W.W. Norton & Co. ISBN 0-393-04642-7. Taylor, Edwin F.; Wheeler, John Archibald (2000). Exploring Black Holes: Introduction to General Relativity. Addison Wesley. ISBN 0-201-38423-X. ^ Wheeler & Ford 1998, pp. 64, 71. ^ Wheeler & Ford 1998, pp. 71–75. ^ Wheeler & Ford 1998, pp. 78–80. ^ Leonhart 1939, p. 287. ^ a b Wheeler & Ford 1998, p. 85. ^ Wheeler & Ford 1998, p. 97. ^ Wheeler & Ford 1998, pp. 105–107. ^ Wheeler & Ford 1998, pp. 123–127. ^ Breit, G.; Wheeler, John (December 1934). "Collision of Two Light Quanta". Physical Review. American Physical Society. 46 (12): 1087–1091. Bibcode:1934PhRv...46.1087B. doi:10.1103/PhysRev.46.1087. ^ Wheeler & Ford 1998, pp. 151–152. ^ a b c Ford, Kenneth W. (February 4, 1994). "Interview with Dr. John Wheeler – Session VI". American Institute of Physics. Archived from the original on February 2, 2013. ^ a b c d MacPherson, Kitta (April 14, 2008). "Leading physicist John Wheeler dies at age 96". News at Princeton. Archived from the original on April 13, 2016. ^ a b Mehra & Rechenberg 1982, p. 990. ^ Wheeler, John A. (December 1937). "On the Mathematical Description of Light Nuclei by the Method of Resonating Group Structure". Physical Review. American Physical Society. 52 (11): 1107–1122. Bibcode:1937PhRv...52.1107W. doi:10.1103/PhysRev.52.1107. ^ Teller, E.; Wheeler, J. A. (May 1938). "On the Rotation of the Atomic Nucleus". Physical Review. American Physical Society. 53 (10): 778–789. Bibcode:1938PhRv...53..778T. doi:10.1103/PhysRev.53.778. ^ Mehra & Rechenberg 1982, pp. 990–991. ^ Way, Katharine (May 1939). "The Liquid-Drop Model and Nuclear Moments". Physical Review. American Physical Society. 55 (10): 963–965. Bibcode:1939PhRv...55..963W. doi:10.1103/PhysRev.55.963. ^ Bohr, Niels; Wheeler, John Archibald (September 1939). "The Mechanism of Nuclear Fission". Phys. Rev. American Physical Society. 56 (5): 426–450. Bibcode:1939PhRv...56..426B. doi:10.1103/PhysRev.56.426. ^ Wheeler & Ford 1998, pp. 27–28. ^ Bohr, Niels; Wheeler, John Archibald (November 1939). "The Fission of Protactinium". Physical Review. American Physical Society. 56 (10): 1065–1066. Bibcode:1939PhRv...56.1065B. doi:10.1103/PhysRev.56.1065.2. ^ Bohr, Niels; Wheeler, John Archibald (January 1940). "Resumés of Recent Research". Journal of Applied Physics. 11 (1): 70–71. Bibcode:1940JAP....11...70.. doi:10.1063/1.1712708. ISSN 0021-8979. ^ a b Wheeler & Ford 1998, p. 31. ^ Wheeler & Ford 1998, pp. 117–118. ^ Wheeler & Ford 1998, p. 39. ^ a b Ford, Kenneth W. (February 14, 1994). "Interview with Dr. John Wheeler – Session VII". American Institute of Physics. Archived from the original on February 1, 2013. ^ Christy, R. F.; Wheeler, J. A. (January 1, 1943). "Chain Reaction of Pure Fissionable Materials in Solution". Metallurgical Laboratory. ^ Wheeler & Ford 1998, p. 40. ^ Weinberg 1994, p. 14. ^ Weinberg 1994, pp. 27–30. ^ Jones 1985, p. 203. ^ a b Wheeler & Ford 1998, pp. 46–48. ^ Jones 1985, pp. 210–211. ^ Rhodes 1986, pp. 558–60. ^ Wheeler & Ford 1998, p. 56. ^ a b Wheeler & Ford 1998, p. 61. ^ Gefter, Amanda (January 16, 2014). "Haunted by His Brother, He Revolutionized Physics". Nautilus (9). ^ Wheeler & Ford 1998, p. 75. ^ Wheeler & Ford 1998, pp. 161–162. ^ Wheeler & Ford 1998, pp. 171–177. ^ Wheeler, John (March 1947). "Mechanism of Capture of Slow Mesons". Physical Review. American Physical Society. 71 (5): 320–321. Bibcode:1947PhRv...71..320W. doi:10.1103/PhysRev.71.320. ^ Tiomno; Wheeler, J. A. (January 1949). "Charge-Exchange Reaction of the μ-Meson with the Nucleus". Reviews of Modern Physics. American Physical Society. 21 (1): 153–165. Bibcode:1949RvMP...21..153T. doi:10.1103/RevModPhys.21.153. ^ Tiomno, J.; Wheeler, J. A. (January 1949). "Energy Spectrum of Electrons from Meson Decay". Reviews of Modern Physics. 21 (1): 144–152. Bibcode:1949RvMP...21..144T. doi:10.1103/RevModPhys.21.144. ^ Wheeler, John (November 1953). "Mu Meson as Nuclear Probe Particle". Physical Review. American Physical Society. 92 (3): 812–816. Bibcode:1953PhRv...92..812W. doi:10.1103/PhysRev.92.812. ^ Wheeler & Ford 1998, pp. 177–179. ^ "John A. Wheeler". John Simon Guggenheim Memorial Foundation. Retrieved December 6, 2014. ^ Wheeler & Ford 1998, p. 183. ^ a b Wheeler & Ford 1998, pp. 188–189. ^ Rhodes 1995, pp. 416–417. ^ Wheeler & Ford 1998, p. 202. ^ Wheeler & Ford 1998, pp. 193–194. ^ Wheeler & Ford 1998, p. 196. ^ Rhodes 1995, pp. 457–464. ^ a b c Wheeler & Ford 1998, pp. 218–220. ^ Wheeler & Ford 1998, pp. 285–286. ^ Ford, Kenneth W. (April 2009). "John Wheeler's work on particles, nuclei, and weapons". Physics Today. 62 (4): 29–33. Bibcode:2009PhT....62d..29F. doi:10.1063/1.3120893. ^ Wheeler & Ford 1998, pp. 224–225. ^ a b Wheeler, J. A. (January 1955). "Geons". Physical Review. 97 (2): 511–536. Bibcode:1955PhRv...97..511W. doi:10.1103/PhysRev.97.511. ^ Wheeler & Ford 1998, p. 237. ^ J. Wheeler (1961). "Geometrodynamics and the Problem of Motion". Reviews of Modern Physics. 44 (1): 63–78. Bibcode:1961RvMP...33...63W. doi:10.1103/RevModPhys.33.63. ^ J. Wheeler (1957). "On the nature of quantum geometrodynamics". Ann. Phys. 2 (6): 604–614. Bibcode:1957AnPhy...2..604W. doi:10.1016/0003-4916(57)90050-7. ^ Wheeler & Ford 1998, p. 248. ^ Hawking et al. 2003, pp. 80–88. ^ Wheeler & Ford 1998, pp. 239–241. ^ Misner, Charles W.; Wheeler, John A. (December 1957). "Classical Physics as Geometry". Annals of Physics. 2 (6): 525–603. Bibcode:1957AnPhy...2..604W. doi:10.1016/0003-4916(57)90050-7. ISSN 0003-4916. ^ Wheeler & Ford 1998, p. 296. ^ DeWitt, B. S. (1967). "Quantum Theory of Gravity. I. The Canonical Theory". Phys. Rev. 160 (5): 1113–1148. Bibcode:1967PhRv..160.1113D. doi:10.1103/PhysRev.160.1113. ^ Hartle, J.; Hawking, S. (December 1983). "Wave function of the Universe". Physical Review D. American Physical Society. 28 (12): 2960–2975. Bibcode:1983PhRvD..28.2960H. doi:10.1103/PhysRevD.28.2960. ^ a b c "Report of the Memorial Resolution Committee for John A. Wheeler" (PDF). Retrieved December 6, 2014. ^ Misner, Charles W.; Thorne, Kip S.; Zurek, Wojciech H. (April 2009). "John Wheeler, relativity, and quantum information" (PDF). Physics Today. 62 (4): 40–46. Bibcode:2009PhT....62d..40M. doi:10.1063/1.3120895. ^ Wheeler & Ford 1998, pp. 334–339. ^ Saunders 2010, p. 6. ^ Wheeler & Ford 1998, pp. 232–234. ^ Christensen, Terry M. (April 2009). "John Wheeler's Mentorship: An Eenduring Legacy". Physics Today. 62 (4): 55–59. Bibcode:2009PhT....62d..55C. doi:10.1063/1.3120897. ^ Wyler, John Archibald (1974). "Rasputin, Science, and the Transmogrification of Destiny" (PDF). General Relativity and Gravitation. 5 (2): 175–182. Bibcode:1974GReGr...5..175W. doi:10.1007/BF00763499. ^ Misner 2010, p. 22. ^ Ford 2006, p. 2. ^ Wheeler 1990, p. 5. ^ Gribbin, Gribbin & Gribbin 2000, pp. 270-271. ^ "The anthropic universe". Science Show. 18 February 2006. ^ Gardner & 1981, pp. 185ff. ^ a b Wheeler & Ford 1998, pp. 342–343. ^ Wheeler, J. A. (1979). "Parapsychology – A correction". Science. 205 (4402): 144. doi:10.1126/science.205.4402.144-b. ^ Wheeler & Ford 1998, pp. 121–122. ^ Wheeler & Ford 1998, pp. 144–145. ^ a b "Obituaries". www.towntopics.com. Retrieved 2016-01-08. ^ "Princeton University – Leading physicist John Wheeler dies at age 96". www.princeton.edu. Archived from the original on 2016-01-12. Retrieved 2016-01-08. ^ Carlson, Michael. "Obituary: John Wheeler". the Guardian. Retrieved 2016-01-08. ^ Overbye, Dennis (April 14, 2008). "John A. Wheeler, Physicist Who Coined the Term 'Black Hole', Is Dead at 96". The New York Times. Retrieved April 15, 2008. John A. Wheeler, a visionary physicist and teacher who helped invent the theory of nuclear fission, gave black holes their name and argued about the nature of reality with Albert Einstein and Niels Bohr, died Sunday morning at his home at Meadow Lakes in Hightstown, N.J. He was 96. Ford, Kenneth (Winter 2006). "Update on John Archibald Wheeler" (PDF). Princeton Physics News. 2 (1). Archived from the original (PDF) on 2014-11-06. Gardner, Martin (1981). Science: Good, Bad, and Bogus. Buffalo, New York: Prometheus Books. ISBN 0-87975-144-4. Gribbin, John; Gribbin, Mary; Gribbin, Jonathan (2000). Q is for Quantum: An Encyclopedia of Particle Physics. New York: Simon and Schuster. ISBN 9780684863153. OCLC 43411619. Hawking, Stephen; Gibbons, G. W.; Shellard, E. P. S.; Rankin, S. J. (2003). The Future of Theoretical Physics and Cosmology: Celebrating Stephen Hawking's 60th birthday. Cambridge, U.K.: Cambridge University Press. ISBN 978-0-521-82081-3. OCLC 51324005. Jones, Vincent (1985). Manhattan: The Army and the Atomic Bomb (PDF). Washington, D.C.: United States Army Center of Military History. OCLC 10913875. Retrieved 8 June 2013. Leonhart, James Chancellor (1939). One Hundred Years of the Baltimore City College. Baltimore: H. G. Roebuck & Son. Mehra, Jagdish; Rechenberg, Helmut (1982). The Historical Development of Quantum Theory. New York: Springer. ISBN 978-0-387-95086-0. OCLC 7944997. Misner, Charles W. (2010). "John Wheeler and the Reccertification of General Relativity as True Physics". In Ciufolini and, Ignazio; Matzner, Richard A. (eds.). General Relativity and John Archibald Wheeler. New York: Springer. doi:10.1007/978-90-481-3735-0_2. ISBN 9789048137350. Rhodes, Richard (1986). The Making of the Atomic Bomb. New York: Simon & Schuster. ISBN 0-671-44133-7. OCLC 13793436. Rhodes, Richard (1995). Dark Sun: The Making of the Hydrogen Bomb. New York: Simon & Schuster. ISBN 0-684-80400-X. OCLC 32509950. Saunders, Simon (2010). Many Worlds? Everett, Quantum Theory, and Reality. New York: Oxford University Press. ISBN 978-0-19-956056-1. Weinberg, Alvin (1994). The First Nuclear Era: The Life and Times of a Technological Fixer. New York: AIP Press. ISBN 1-56396-358-2. Wheeler, John A. (1990). "Information, physics, quantum: The search for links". In Zurek, Wojciech Hubert (ed.). Complexity, Entropy, and the Physics of Information. Redwood City, California: Addison-Wesley. ISBN 978-0-201-51509-1. OCLC 21482771. Wheeler, John Archibald; Ford, Kenneth (1998). Geons, Black Holes, and Quantum Foam: A Life in Physics. New York: W.W. Norton & Co. ISBN 0-393-04642-7. Wheeler, John Archibald (1987). Cosmology, Physics and Philosophy (2nd ed.). New York: Springer Verlag. ISBN 0-387-90581-2. Wikimedia Commons has media related to John Archibald Wheeler. This page was last edited on 28 March 2019, at 00:44 (UTC).